BEST CREATINE™ has gone through the rigorous ChromaDex® quality verification program, which ensures that it is of the highest quality possible. BEST CREATINE™ BLEND (Proprietary): Creatine monohydrate, Creatine anhydrous, Creatine MagnaPower® (as magnesium creatine chelate), Creatine phosphate, Creatine AKG pH buffered Creatine alkaline™. Betaine anhydrous (TMG) buffered. Himalayan Pink Salt. Fruit Punch: Maltodextrin, silica, natural and artificial flavors, citric acid, sucralose, malic acid, acesulfame K, and FD&C Red No 40. Icy Blue Raz: Natural and artificial flavors, citric acid, malic acid, maltodextrin, silica, sucralose, acesulfame k, and FD&C Blue No. 1. Lime Sherbet: Maltodextrin, silica, natural and artificial flavors, citric acid, sucralose, malic acid, acesulfame K, FD&C Yellow No 5, and FD&C Blue No 1. Snow Cone: Natural and artificial flavors, citric acid, malic acid, maltodextrin, silica, sucralose, acesulfame k, FD&C Blue No. 1, and FD&C Red No. 40. Watermelon Cooler: Maltodextrin, silica, natural and artificial flavors, citric acid, sucralose, malic acid, acesulfame K, and FD&C Red No 40. Unflavored: Maltodextrin, silica, natural flavor, citric acid, sucralose, malic acid, and acesulfame K.
Rainbow Ice: Natural and artificial flavors, citric acid, maltodextrin, sucralose, malic acid, acesulfame-K, silica, and FD&C Blue No. 1. 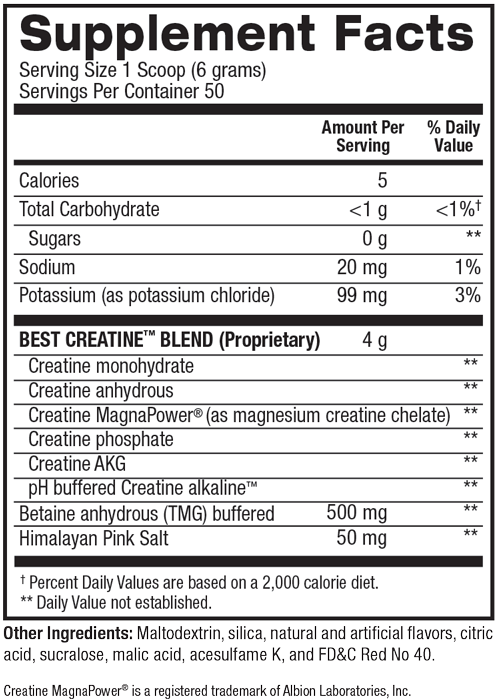 Best Creatine™ is a multi-creatine blend that acts as muscle-building fuel for your body. This no-sugar creatine blend has been formulated to enhance strength and muscle growth as well as recovery. IS THERE CAFFEINE IN BEST CREATINE™? No, there is no caffeine in Best Creatine™. WHAT CAN I STACK BEST CREATINE™ WITH? You can stack Best Creatine™ with any other BPI Sports supplements. WILL BEST CREATINE™ GIVE ME A PUMP? Best Creatine™ does not necessarily provide a pump; it is meant for increasing strength, enhanced recovery, and overall improved performance. HOW LONG CAN I TAKE BEST CREATINE™ FOR? We recommend using Best Creatine™ for 4-8 weeks consecutively with a 4-week break in between cycles. IS IT NECESSARY TO LOAD BEST CREATINE™? No, it is not necessary to load with Best Creatine™.